Starting January 2015 in San Jose, California, a new law will be put in place restricting full contact practices for middle and high school football teams. The new law will allow only two full-contact practices per week, and they cannot exceed 90 minutes. Also, during the offseason, there will be no full-contact practices allowed at all. In fact, 19 other states have issued a no contact rule during the offseason as well. What is the reason for the new law that is being put in place? There has been a great deal of concern over the amount of concussions and other brain injuries brought upon students because of strenuous practices. Football is a violent, and sometimes dangerous sport. There are many organizations trying to stress and teach the importance of learning how to recognize the symptoms of a concussion. 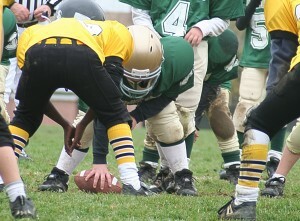 In addition to preventing concussions, there is also the chance a player can have broken bones, or even be paralyzed due to a spinal injury during a tackle. There is also the concern for students who go to contact camps during the summer, and how the lack of tackling practice will affect them. The concern is that if students are not regularly practicing tackling and being tackled, and then they go to tackle camp, they will not know how to protect themselves compared to students who have had more experience. Overall, the California lawmakers are trying their best to prevent life threatening injuries to these young athletes. Do you think the law should be modified to be more or less strict? If so, how?